Around 35,000 attended a rally against racism and xenophobia in the German city of Dresden, joining hundreds of thousands, who took to the street in France in response to this week’s Charlie Hebdo attack and hostage crises caused by Islamic radicals. "We won't permit hate to divide us," Helma Orosz, Dresden's mayor, told the crowd as cited by Reuters. The demonstrators carried banners, reading “We are Charlie,” “No to racism,” “We all laugh in the same language” and "Germany is for all." The gathering, jointly organized by the Dresden administration and the government of Saxony, was also a response to a series of anti-immigrant rallies, which recently took place in the city. "We stand here not in protest or opposition but for all Dresden, for Saxony and for everyone who lives here," she added. "Regardless of whether you're Christian, Jewish, Hindu or Muslim - we will not be separated by hate." 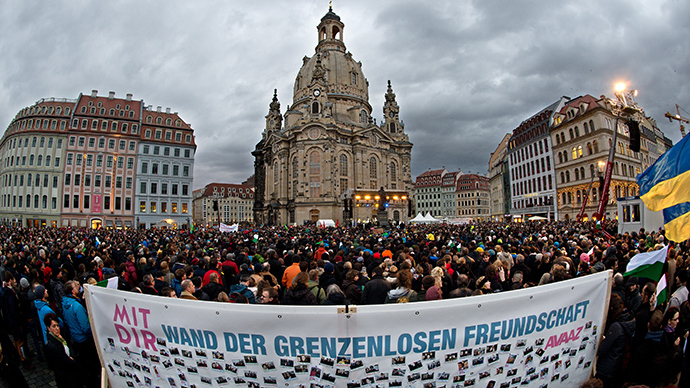 A 10-meter structure, called ‘Wall of Friendship without Borders’ was also displayed during the Dresden rally. It was erected as part of a new social media campaign launched under the #lovestorm hashtag. “Wall of Friendship without Borders’ is to show that whoever comes to Germany is very welcome," Christoph Schott, campaign leader, told Deutsche Welle. The project urged people to take a photo with a friend from another country or religion and post it on the wall or online. "We want to show that most of Germany is not in line with what PEGIDA does," Schott said. "It's really important to set the tone of where Germany stands on such issues. In the future Germany is only going to become more diverse." Patriotic Europeans against the Islamisation of the West (PEGIDA) movement has been holding weekly rallies in Dresden since October. The protests, which initially gathered no more than 500 people, hit a record attendance of 18,000 last Monday. PEGIDA plans to stage its own demonstration to commemorate the victims of the Charlie Hebdo massacre on January 12, AFP reports. The movement asked its followers "to wear black armbands" and "observe a minute's silence" for the 17 people killed during the three days of violence in France. On Saturday, Merkel urged Germans to differentiate between ordinary Muslims and Islamic radicals. However, polls conducted before the Islamist attacks in Paris revealed that an increasing majority of Germans feel threatened by Islam. A total 700,000 marched across France on Saturday to condemn the killings by the Islamic radicals, the country’s Interior Ministry said. On Wednesday, two gunmen – Cherif and Said Kouachi – attacked the office of Charlie Hebdo satirical magazine in Paris, killing 12 people, including the magazine's top editor, prominent cartoonists, and two policemen. On Thursday, a policewoman was gunned down in the French capital by a terrorist named, Amedy Coulibaly. The man took hostages in a kosher store in north-east Paris, killing four people on January 9. The Kouachi brothers and Coulibaly were neutralized in two separate operations by the French police on Friday. The terrorists told French TV that they coordinated their actions with Al-Qaeda in Yemen reportedly claiming responsibility for the attacks.